In 1942, during the Second World War, British media reported on the successes, and sometimes failures, of this nation’s defiance against the enemy. There were often be acts of supreme heroism to report upon, and no one had grounds to question the sterling job our servicemen and women done to protect us from the enemy. Perhaps it is a time we cannot relate to today. For the civilians there was still the routine of daily life, which we do experience today, that of adults working and children going to school. What follows is a tale of an encounter between a British serviceman, stationed in Norfolk, and a schoolgirl, evacuated to Norfolk. That encounter would be brutal and have consequences for both. It would lead to newspapers across the land printing the encounter and the subsequent fall out, from the regionals – Bury Free Press, Liverpool Echo, Yorkshire Evening Press and Dundee Courier; to the huge nationals – the Daily Mirror and the Daily Telegraph. In some cases, the story competed with news on the war effort. Yet today, the tale is largely unknown. It was Tuesday 5th May, 1942. Mrs (Florrie?) Pask, of Stud Cottage, Riddlesworth, near Thetford became concerned when her fostered daughter, six-year-old Patricia Ann Cupit, had not returned home from school. It was 5pm. Patricia was usually home by 4.20pm. She was so concerned, that she hopped onto her cycle and went out looking for the child. Her mission was unsuccessful, so she returned home after forty-five minutes. She then received a message that Patricia had been found in bushes on Riddlesworth Park, near Riddlesworth Hall. Mrs Pask set off to meet her husband (Albie?) there. It seems a thirteen-year-old local lad, who had popped over to the Pask’s to deliver a message from the local blacksmith, had been told about the girl’s disappearance, so he set off to assist in the search. His discovery of Patricia’s hat then led him to the child lying under a bush. He fetched the school’s sports mistress, who in turn called the police and an ambulance. During this time Mr Pask arrived on the scene and waited by Patricia’s side. Patricia was alive. Barely. Her face was covered in blood and she was breathing very deeply. She had been covered, from her chin to her knees, with cocoa matting. At 8pm, an ambulance arrived at the West Suffolk Hospital in Bury St Edmunds, with Patricia on board, still unconscious and clinging on to life. Patricia’s condition was so delicate that doctors dared not risk putting her through any medical procedures. Instead she laid in bed with a policeman sat at her side just in case she regained consciousness and shed some light on what had happened. Her parents, Leonard and Anne Cupit, arrived in the early hours of the morning, just in time to be with Patricia when she passed away at 6.50am, on Wednesday 6th May. On the fateful day of Tuesday 5th May, 1942, Patricia finished her breakfast of bread and milk, then ten minutes later, at 8.20am, she left the Pask’s home for school. She was dressed in a blue gym slip, green jumper, pink overcoat, pink hat and brown shoes. In her hand she carried a silver coloured handbag containing her lunch of four sandwiches and a cake. Patricia’s route followed a path through Riddlesworth Park, skimming the southern edge of a military camp, onwards to a Council School beyond Riddlesworth Hall. The route was a little over a mile, and at Patricia’s pace would have taken her about forty minutes to reach school, which started at 9am. On that fateful day, Patricia never arrived at school, nor could anyone recall seeing her walking. It was only when she failed to return home that the alarm was raised. The police immediately began interviewing people, including servicemen from a local military camp, staff at Riddlesworth school and civilians living nearby. In all, about two-hundred people were interviewed, and statements taken. This was a huge task accomplished with the combined efforts of local police, Norfolk CID and New Scotland Yard. The coroner’s autopsy report came back and made for grim reading. It looked as though Patricia had been stabbed several times around the ears, jaw, lips and cheek. There were injuries, such as bruising and partial strangulation, that were consistent with her being grabbed and forced into vegetation. She had suffered a cerebral haemorrhage, shock and cardiac failure. Attention focused on the military camp, although most of the servicemen had been away that day, either excavating at a local quarry or visiting another military camp four miles away. On Sunday 10th May, Chief Inspector Barratt, of New Scotland Yard, was taking routine statements from servicemen of the 218th Company, Pioneer Corps, based at the military camp, when Lance Corporal E.J. Molson gave Barratt a lead. The soldier stated he had been on parade at 7.45 on the morning that Patricia went missing and was put in charge of a party of five other soldiers while the rest of the base left for various chores. It appears the five soldiers in his charge were to be taken to Cambridge at 10.45am for testing, as there were questions over their mental health. He was to put the men to work for a few hours and so they went about removing the covering from a disused ammunition dump. The dump was near the footpath used by Patricia. The police had already interviewed those five soldiers and not found anything to implicate them. Molson stated they started work at 8.15am, then at about 8.30am he gave a soldier permission to leave the work detail in order to visit the toilet. Molson then went off to inspect a trench being dug nearby, when he returned to the ammunition dump at about 9am, he found the soldier had still not returned. A while later the soldier did return to work but he had a flushed face and was sweating profusely. When the other soldiers asked why he was sweating so much, he replied, “It’s the bloody weather! Don’t you think it’s hot?” The working party had not thought much else about it and continued working. The police caught up with the soldier in question, Private James Wyeth, and asked him about his disappearance from the work party. He replied that he had indeed gone to the toilet, but first took a detour to his accommodation hut to pick up a newspaper. Then he met a colleague, had a chat with him about what tools to take back to the work party and finally sat in the toilet reading the newspaper for thirty minutes. He could not recall seeing any small girls along the way. The police then questioned the soldier that Wyeth alleged he had spoken to. The soldier denied meeting Wyeth that morning. Wyeth’s story simply did not stack up. With Chief Inspector Barratt in attendance, Wyeth made an admission, “I want to tell you that I went with the girl and I want to tell you what I done to her.” Wyeth said he was with the working party when he saw a girl in a pink coat walk past. He then confessed to attacking the girl, “I had a feeling come over me to follow her. I had a headache that morning and was feeling rough. I asked the corporal whether I could go to the lavatory and on being given permission I went and turned onto the path where the child had gone. I followed her and got hold of her by the back of her neck. I remembered nothing else until I saw her lying there with her face all covered in blood. I have been very worried since and cannot concentrate.” Wyeth was cautioned. He would now have to bear responsibility for his actions. On Friday, 15th May, at 12.40pm, Wyeth appeared at an Occasional Court in Thetford’s police station. The magistrates were Mr H.W. Watling (Thetford Mayor and chairman) and Sir William Gentle, while the Clerk was Mr Reginald Clowes. Also present were Captain S.H. Van Neck, M.C. (Chief Constable of Norfolk Police), Detective Inspector Garner (Norfolk CID), Chief Inspector Barratt and Detective Sergeant Webb (both of New Scotland Yard) and Inspector G. Dye (Thetford Police). Wyeth, wearing his army battledress, made no reply while he was charged with the murder of Patricia Cupit. Detective Inspector Garner then asked the court, and got approval, to remand Wyeth in custody until a later hearing. At the hearing in East Harling police station, on 1st June, magistrates were read evidence from Dr J.M. Webster, Home Office pathologist. He declared he had found the child to have been healthy and her death caused by violence. For the prosecution, Mr G.R. Paling, referred to Wyeth’s admission. This hearing projected Wyeth and Patricia into newspapers across the land. The slaying of a 6½ year old evacuee, living in rural Norfolk, was reported without censorship in national and regional papers alike. From this point, events left Norfolk and headed to the capital, into London’s Old Bailey, it introduced experimental medical equipment into the courtroom and ultimately the higher echelons of the British wartime Government would decide Wyeth’s fate. Finally, the culmination of Wyeth’s trial at the Old Bailey, took place on Friday, 17th July, 1942. It all began with Wyeth pleading not guilty to the charge of murdering Patricia. Prosecutor, Sir Charles Doughty, King’s Council, told the court that Patricia had left for school that day and was later found in bushes. He said that Wyeth had admitted to following the girl and grabbing her, and that Wyeth had then claimed to not remember how the girl had ended up mortally injured and covered in blood. She had been covered with cocoa matting, suffering head wounds. Three small threads found on Wyeth’s clothing matched those from Patricia’s clothes. His clothing also had small blood splatters on it. Dr Louis Rose, of Norwich, and for the defence, told the court he was a specialist in mental illness. He then told the court that he had tested Wyeth with an electro-encephalograph. This device measured brain waves and Dr Rose claimed it could assist in a diagnosis of epilepsy. It was very much in its infancy and was the first time ever it had been used in a British murder trial. He informed the court that he had found minor abnormalities with Wyeth’s brain, but there was not enough evidence for a clear diagnosis. He concluded that Wyeth had a sub-standard intelligence. “My opinion is that he does not know the difference between right and wrong”, Dr Rose said of Wyeth. A witness for the prosecution, Dr Hugh Grierson, Senior Medical Officer of Brixton Prison, told the court that Wyeth was an introvert and solitary person. He agreed that Wyeth was abnormal, but he was not satisfied that Wyeth’s apparent lack of memory at what had happened to Patricia was genuine. Mr F.T. Alpe, for the defence, asked the judge to consider a verdict of guilty but insane. Mr Alpe knew Wyeth was facing the death penalty, such was the weight of evidence against him, but the sentence would be commuted to a custodial one if the judge was persuaded that Wyeth was mentally ill. The judge, Mr Justice Wrottesley, summed up, “Impulses to which human nature is liable, may include horrible, beastly, cruel impulses. It is the duty of us all to resist evil impulses. The fact that a person does not resist a wrong impulse is not insanity, or the criminal courts of this country might go out of work.” He found Wyeth guilty of the murder of 6½ year old Patricia Cubit and handed out a sentence of death to Wyeth. The nation’s reporters raced to meet their evening deadlines and be among the first to report upon the verdict. Ten days later, Wyeth’s legal team lodged an appeal. During the Old Bailey trial, Chief Inspector Barratt told the jury that Wyeth’s natural mother had ‘tramped’ around the country and had been prosecuted for neglect. Evelyn Wyeth also gave a statement, telling the trial she had adopted Wyeth, who was born in 1920, when he was just fifteen months old. Wyeth’s surname was that of his adopted mother, not his natural one. It seems he and his sister had suffered at the hands of their natural mother, with both children later being diagnosed with epilepsy. By the age of fifteen, Wyeth had been in constant trouble for threatening and frightening girls, leading to him being bound over on two occasions. The first took place in August 1935, the second, when he attacked a seven-year-old girl, in November that same year. Evelyn had resorted to taking him to weekly appointments with a specialist in mental illness, but even this did not stop him from attacking two girls aged five and nine in March 1936. This time, local magistrates sent him off for a spell in Feltham Boys’ Prison. At the outbreak of war Wyeth was back living at 9 Cedar Road, Maidenhead, Berkshire, with his adopted parents and brother. He was employed on the production line of a biscuit factory, but any thoughts he had learned the error of his ways was smashed the following year. He was again charged with attacking a female. This time his attack was more brutal than previously. He also discovered his actions exposed him to the full force of the justice system as an adult, instead of as a minor. Wyeth’s last appearance in court was on Tuesday 25th August 1942, at the Court of Criminal Appeal, where three High Court Judges heard his legal team appeal against the sentence of death. Once again, he appeared in full army battle dress. The Judges – Mr Justice Humphreys, Mr Justice Hilbery and Mr Justice Tucker; heard the appeal from Mr Alpe, who again was defending Wyeth. Alpe suggested Wyeth’s trial had not explored the question of the accused’s insanity, it had been stated that Wyeth was merely “abnormal”, not insane. Alpe felt that Mr Justice Wrottesley, judge at the previous trial, had misdirected the jury by not exploring Wyeth’s mental health. A doctor was called as a defence witness, informing the judges he was certain Wyeth was telling the truth about not knowing what had happened to Patricia. He confirmed that Wyeth had two blood relatives who were being detained in mental care homes. His belief was that Wyeth should have been sentenced as insane, so spared the death penalty. Mr Justice Humphreys gave his judgement. He did not even call for the prosecution (Sir Charles Doughty, K.C. ), but instead immediately dismissed the defence’s appeal. He relayed testimony from a senior medical officer in the prison that Wyeth had been held since the trial. The medical officer had stated he saw no evidence that Wyeth was insane, and from his daily contact with him he was certain Wyeth would have known what he was doing when he attacked Patricia. Mr Justice Humphreys then reminded the court that Wyeth had attempted to cover the child’s body with sacking to hide his brutal actions, Wyeth claiming he could not remember anything was no defence. Mr Justice Humphreys was certain there had been no misdirection at the trial, he felt it was a full and fair trial, so he found no fault with the previous proceedings. The sentence of death was a valid one. After the verdict, four wardens escorted Wyeth from the dock. The circumstances surrounding the involvement of Herbert Morrison, Winston Churchill’s Home Secretary, are not currently known. A recent Freedom of Information request has been refused on grounds that one, or more, of the persons involved in the review could still be living. I am currently appealing this decision, although I am uncertain of the outcome. What I do know is that Mr Morrison reviewed Wyeth’s case and classified the accused as being insane. Wyeth was reprieved from the death sentence and instead sent to Broadmoor Prison to serve his time. James Wyeth’s death was registered in the final quarter of 1983. Through my research of this sad case I have been contacted by the family of Patricia Cupit. 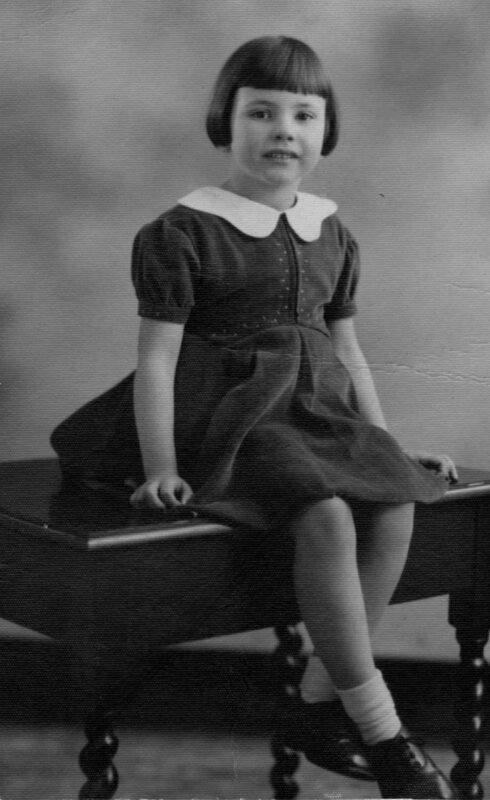 It seems her parents did bear more children after her and her sister, Susan, supplied me with a photo of Patricia. Upon seeing Patricia, I can see how bubbly and happy she looks. Then I am fill with sadness that I know how brutally her life was cut short so soon after the photo. Patricia could never know what was to come. Susan said she knew little of what happened to her sister as her mother was very reluctant to talk about it. It seems Patricia’s body was taken back to London and buried in Streatham Park Cemetery. A niece of Patricia, Anna Allan, has visited the child’s grave, which appears to be unmarked. Patricia has another sister. Her name is ‘Pat’. At the police court hearing in East Harling, in 1942, Patricia’s school mistress told the magistrates that Patricia had a trusting and friendly nature. A newspaper at the time quoted Mrs Pask, as saying, “Patricia was the most adorable child in the world. All the village loved her.” It is high time for six-year-old Patricia to have a memorial, especially if her grave is not marked.